Moderate exercise, such as brisk walking, for 45 minutes a day, five days a week can reduce the risk of a cold by a third. The best results are long-term. In one recent British Columbia study, women who walked for 12 months had the most resistance to colds in the final quarter of the year. Mom was right when she told you to eat right and get plenty of rest; that, along with exercise and stress reduction, keeps your immune system healthy and better able to withstand infection. Eat plenty of vegetables and fruits that offer antioxidants. Also, try to get seven to eight hours of sleep a night. Use warm water and a good helping of soap. Plain soap is fine because it's the act of rubbing the hands together for at least 20 seconds that is going to eliminate germs. Don't forget to clean under the nails, between the fingers, and wash your wrists as well. In public bathrooms, use a paper towel to turn off the facet, another one to dry your hands, and throw them away. Without thinking, we rub our eyes, cover our mouths or rub our noses with our hands. That is a sure way to infect yourself with cold virus particles. Keep your fingers away from your nose and your eyes to avoid viral infections. Children share cold viruses easily -- and bring them into your home. Teach your child to cough or sneeze into a tissue and instill a life-long habit that is the key to illness prevention: handwashing. Vaccines are the surest way to prevent the flu. The best time to get a flu vaccine is from October through November, although you can get the vaccine even later during flu season. 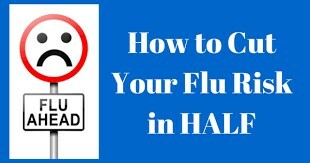 Get the flu vaccine every year. Flu viruses are constantly changing and new vaccines are developed each year to protect against new strains.